These crostini made for Hay Hay It’s Donna Day #4 hosted by Bron Marshall. Remember! Any money you can pledge, even the smallest amount, will help Food Runners to stop good food going to waste and help feed the needy in San Francisco. 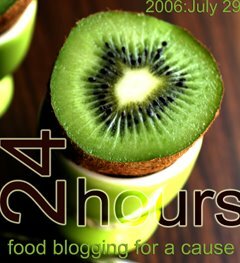 Visit the Food Runners website. suprisingly the courgette is my favourite of the three. I *will be stealing* your crostini recipes for future party use. Great to see you participating in this event Sam. It is 8AM in NZ and I've just looked in. You have been busy. I'm inspired to include an entry for Bron's roundup. Love your creativity with the courgettes! Let's roll! What you get up to when I'm pushing up Zzzz!! 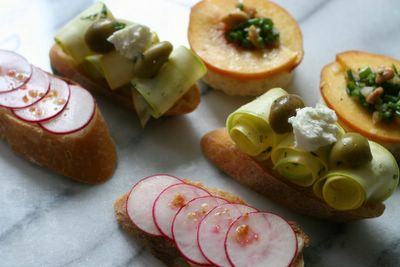 Your trio of crostini looks absolutely gorgeous, well done! Sorry I haven't pledged you anything for the SF Food Runners. I have however given to the equivalent here in my home town, Christchurch, New Zealand on your behalf. I hope that's a cool compromise! Keep up the great work! You ROCK! they are beautiful! it is such a treat to see you blogging this in 'real time'--almost like being there! it's fascinating to see how the experience for me as a reader changes knowing you are blogging every half hour.